Skype learning is a flexible method for language learning for those who do not want to, or cannot regularly attend a language school. You can basically use Skype to learn a language from anywhere and at any time and all depends on the teacher and the student. a language via Skype cost ? 5 to 15 euro per hour. What do I need to learn via skype ? To be able to listen / hear audio. Either via your computer speakers or headphones. To be able to speak through your computer. Course textbook - your Skype teacher will advise you which language textbook to use. A webcam is not necessary. [ webcams are a gimmick and tend only to distract. Go to our Skype language teachers directory and find a Skype language teacher. 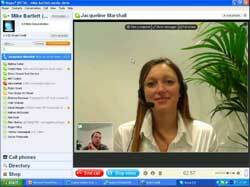 Each Skype teachers has his or her details in their SkypeLearn details page and also their prices and contact details. Our services are free for students. Using Skype to learn a language is the future of language learning and you can learn a language from the comfort of your living room or office.